Yspahan is one of those board games that I saw being played and immediately wrote off as something I would probably hate. Tons of dice to roll, wretched cover art, and a theme that appeared just as uninteresting as the game looked. But, once again I learned that while Euro-game companies have no marketing sense whatsoever, it was the gameplay that overshadowed any other shortcomings. That’s not to say that the board itself isn’t gorgeous. The forced three-dimensional perspective with cute inconsistencies and the color scheme that clearly delineates playable areas are both eye-catching and functional. And the player boards with universal symbology are simple, but effective. However, the game gives the starting player the visceral feeling of rolling up to 12 individual dice. And those dice are sorted into six different levels of a small side tower board depending on the amount of pips on the die result. The starting player then has the best opportunity to remove dice from this tableau, can players remove dice levels from the board until all have chosen an action. Not only does this allow for player interaction, it makes a player truly utilize his/her turn as starting player for the best possible benefit. Sure, because of the dice, there is a bit of luck involved. But, with a mix of strategy and greedy tactics, a player can mitigate that luck tremendously. 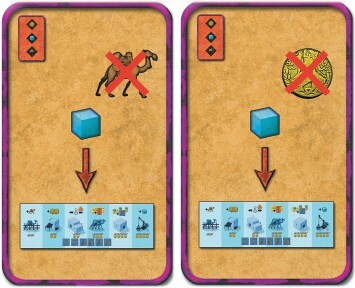 The designer was careful to include all strategic elements for a reason, so it is very difficult to win the game without having a long-term strategy that mixes area control, caravansery building, and improving a player’s personal board. And it’s this greedy, territorial mix with very little negative player interaction, that makes Yspahan so special. The game reasonably plays in just over an hour with 3 or 4, which makes it perfect to start the evening, lifts it a step above a filler game, yet is easily played twice or thrice within one sitting. Do not write this one off as I did. It will surprise you. A very worthy game. Add a Review for "Yspahan"